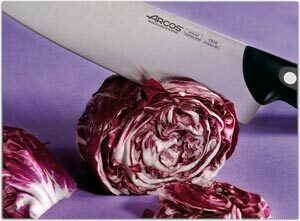 A state-of-the-art kitchen knife that hews to the traditions of its 18th century Spanish origins, this 11-inch carving knife (275 mm) from Arcos is part of its best-selling Maitre series, which is made to be dependably durable for everyday food prep. This 11-inch carver is specially designed for slicing very thin slices of Spanish ham (Jamón), but it will also easily tackle your roasts and poultry. Featuring an exclusive Arcos stainless steel formula called Nitrum, this blade is made from martensitic stainless steel with added molybdenum and vanadium for strengthening. It's then enriched with nitrogen in Arcos' Nitrum process and hardened to 53-56 HRc (on the Rockwell C scale) for extra durability. The nylon plastic handle is infused with micro glass beads for added strength and light resistance to prevent fading, and the three rivets are made of a high-quality stainless alloy to prevent corrosion. Dishwasher safe, though hand washing is recommended. Backed by a 10-year warranty. 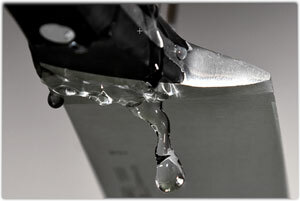 Nitrum is a nitrogen-enriched stainless steel formula that's found exclusively in Arcos knives. With Nitrum stainless steel, your Arcos knife will possess improved hardness for a longer lasting sharpness, enhanced microstructure for higher resistance to corrosion and exceptional edge durability for longer periods between re-sharpening. The Nitrum production process has no negative effect on the air, water, or soil.